A coffee table book about the work and life of renowned cinema expert and gifted Sinhala and English writer Tissa Abeysekara will be launched soon by the Tele Makers Guild. The book will be launched at the Tissa Abeysekara Sameepa Roo memorial function which is held to commemorate his death anniversary. 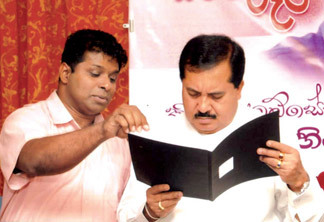 The agreement was signed at a event held at Sausiripaya in the presence of Cultural Minister T B Ekanayake. NFC Chairman Asoka Serasinghe, Tower Hall Foundation Director General lawyer Douglas Siriwardena, Tele Makers Guild president Suresh Abeysekara and artistes Sudath Rohana, Udayakantha Warnasuriya, Bennett Ratnayake, D G Somapala, Anuruddha Jayasinghe, Niroshan Illeperuma, Rohana Dandeniya, Wasath Chandrasiri Gamlath and many others took part in the event. Asanka Abeysekara, Dimithra Abeysekara and writer and senior journalist Ajith Galapatti also took part in the event. The book comprises details of Abeysekara's life, his creations, philosophy, academic research and occupation. It will be printed soon.